Q: Taekwondo, how is it different from other martial arts? A: The martial arts were developed thousands of years ago as forms of self-defense. Karate originated in Japan and Kung Fu came from China. Taekwondo is native to Korea. In terms of techniques, Taekwondo emphasizes kicks more than other martial arts, making it ideal for weaker people, since the legs have greater reach and are stronger than the arms. In addition to this is makes it a much more aerobic workout which will result in better physical conditioning. Q: At what age can my children start? A: Our youngest age we take is 3.5 years old. Starting your child young in Taekwondo training is ideal, and a lot of parents have found that in as little as a year, their children who were involved in Tae Kwon Do had noticeably gained positive traits such as increased self-esteem, respect and overall physical fitness. Q: Do you offer adult programs? A: Yes. We offer adult programs for all shapes, sizes and skill levels. We encourage the participation of women, men, children, parents and grandparents, because everyone can benefit from the study of Taekwondo. Q: Can I take classes with my child? A: Yes, you can! 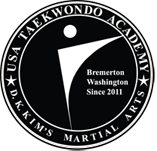 Our schedule and payment plans are designed so you can learn Taekwondo as a family. When you visit us, you will see fathers and sons, mothers and daughters, even grandparents with their grandchildren learning Taekwondo together! Q: How can Taekwondo help adults? A: Adults can benefit from the practice of Taekwondo in many ways. Physically, Taekwondo can help adults improve their balance, flexibility, coordination, endurance, and strength. Furthermore, Taekwondo classes can help adults reduce the stress of daily life, and also help with weight management. Equally important is the development of mental skills such as focus, concentration, self-awareness, and self-control. Through Taekwondo training, adults will also learn and reinforce the important values of respect, goal-setting, patience, self-improvement, friendship, integrity, confidence, concentration, dedication, seriousness, courtesy, self-discipline, perseverance, character, and commitment. For adults, the practice of Taekwondo can help them develop both physically and mentally, and many of our students discover that Taekwondo changes their outlook on life. Q: How can Taekwondo help children? A: Taekwondo can benefit children in many ways. Physically, Taekwondo can help children improve their balance, flexibility, motor coordination, endurance, and strength. Regular activity for children is an essential component of healthy physical development. Equally important is the development of mental skills such as focus, concentration, self-awareness, and self-control. Through Taekwondo training children will also learn the important values of respect, goal-setting, patience, self-improvement, friendship, integrity, confidence, positive attitude, dedication, seriousness, courtesy, self-discipline, perseverance, character, and commitment. Q: May I come watch a class? A: All classes are open to be viewed from the front lobby. Parents of students are encouraged to view classes and give support to their children. A: We have several payment plans available and one is sure to fit your needs. We also offer affordable family rates. Please call or visit for more information.